Hand of Fate is a unique blend of a deck building digital card game with combat that takes place as a third-person brawler/beat em' up game. The title was originally funded by a Kickstarter campaign and has since been released on Steam to "Very Positive" user ratings. Hand of Fate is a solitary affair where the player goes up against the "dealer" who has a mysterious personality and appears to somehow to be both friend and foe. Hand of Fate can be playing in two modes, the first being a campaign mode with a series of random dungeon challenges which culminate in a series of boss challenges, and the other is an open ended "infinite play" mode. 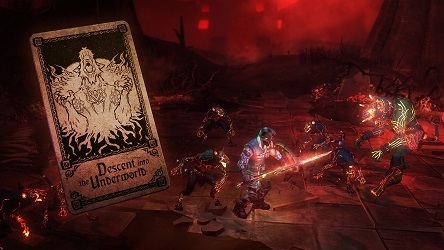 Players begin by playing the campaign mode and defeating the boss/challenge at the end of each campaign in order to complete it and unlock additional cards. Before a match begins, players may select a deck built specifically for that challenge, or opt to customize their deck with other cards from the collection of unlocked cards. The deck constitutes the equipment and abilities the player will have throughout the game. The dealer also creates a deck of enemies and other obstacles which the player must overcome to win. Each completed campaign challenge unlocks the next, which escalate in difficulty. The player begins by being dealt a hand of cards from his pre-built or customized play deck. The AI Dealer character then draws some cards from its deck and plays them face down. 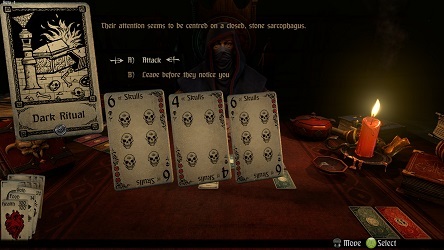 These face down cards constitute the rooms in the "dungeon" the player is attempting to traverse. The player selects which room to move into next by flipping over one of these cards and then dealing with the encounter. In this way, dungeons are randomly generated in a similar style to rogue-likes, simply by the randomness of card draws. The player moves from card to card (or room to room) and resolving encounters with cards from is hand or combat where applicable. Combat in Hand of Fate is handled with a unique third person fighter mini-game which takes place in 3d arenas styled thematically after the card that triggered it. The player enters the fight against enemies that were determined by the opponents card draws, armed with gear and abilities that were determined by his own draws. During combat the player must leverage his available moves and weapons to avoid attacks by enemies while delivering his own to win the skirmish. Wins are rewarded, losses penalized and then its back to the card game to determine the next move in the card dungeon and the next encounter to be had. Hand of Fate definitely is a unique hybrid of game styles that has been greeted with good reviews and described as "more than the sum of its parts". Since the title's release the developers have added a steady stream of updates including three free content add-ons entitled "The White Council", "The Hall of the Goblin King" and "Portals to Underworld". 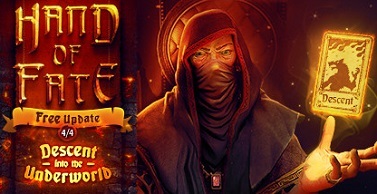 Additionally a paid DLC called "Hand of Fate : Wildcards" is available for $4.99 from the Steam Store. The game is also available on consoles like the Playstation 4 and Xbox One as well as the Windows and Mac versions that are available on Steam.